← Can you sustain it? Our most recent journey has taken us to the Oak Ridge National Laboratory in Oak Ridge, Tennessee. The lab not only holds a key component to our future, but a strong hold to our past. ORNL was part of the Manhattan Project during World War II. The purpose of the Manhattan Project was to manipulate, study, and create atomic weapons out of Uranium. Oak Ridge was chosen because of its hidden location. Today, Oak ridge National Laboratory remains as one of the top notch laboratories in the nation, maybe even the world. 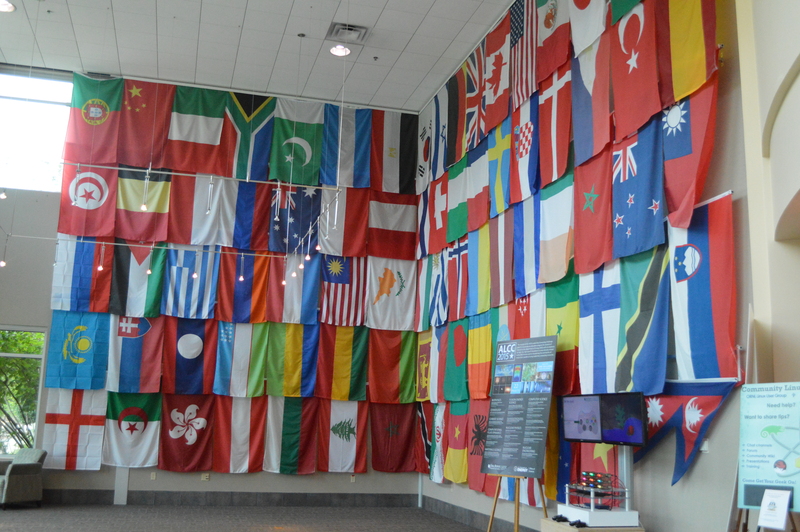 Flags representing the countries where ORNL scientists are from. Now that the history lesson has concluded, we commence with the exciting part of this blog. Our day began earlier than most days should, before noon. Anyway, my fellow Scots Science Scholars, our Peer Mentors, Professors, and I made our way to the Lab via two buses. The weather was typical of a Tennessee summer, really hot and humid. We were directed to dress “business casual” in order to impress our “possible” future colleagues. It’s what we Maryville College students do, impress. The first part of our trek through the lab brought us to the nearest bathroom, which was very important at the time. However, possibly the coolest part for me, was on the way to the bathroom I saw this beautiful wall. The wall was filled to the brim, inch-by-inch, with flags. These flags represented the workers and where they came from. This amazed me that so many people from all over the world come to this small part of Tennessee to work. They could have chosen New York City or San Francisco, but they chose Oak Ridge. The supercomputer room where Titan and Kraken are housed. 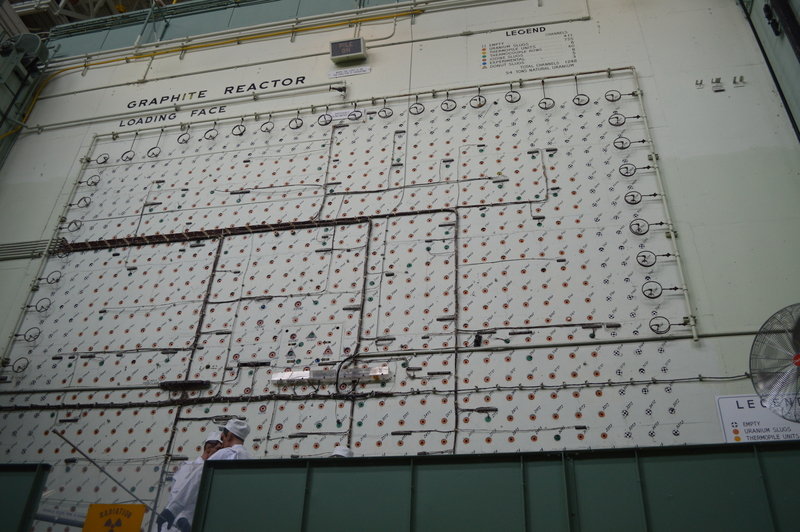 The graphite reactor, where it all began. 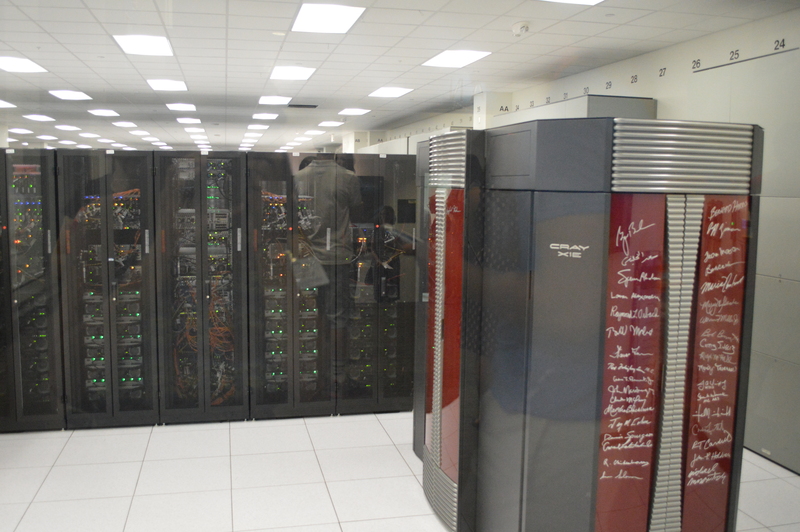 The first part of our tour brought us to see Titan, one of the world’s largest super computers. The Computer Science majors of our family, Cole, Zach, and Evan, had a field day listening to the tour guide talk about Titan and its other super computer pals. Oak ridge is currently working on rising back to the top of the world in super computer speed by building a new computer. Its estimated time of completion is in the next two to three years. After saying goodbye to the glorious refrigerator-like computers, we hopped in our cars and headed to the site of the first nuclear reactor. In this segment of our tour, we were able to learn how the workers who worked during World War II lived and did their job. The leaders of the Manhattan Project at the Oak Ridge site had to spring up houses by the hundreds to accommodate for the scientists, laborers, and every other person they hired to take part in this game-changing plan. These houses were basic and as cookie cutter as could be. The workers did not have it that easy. Nuclear reactors were new tech at the time. A lack in cooling systems basically meant you could blow up at any time. 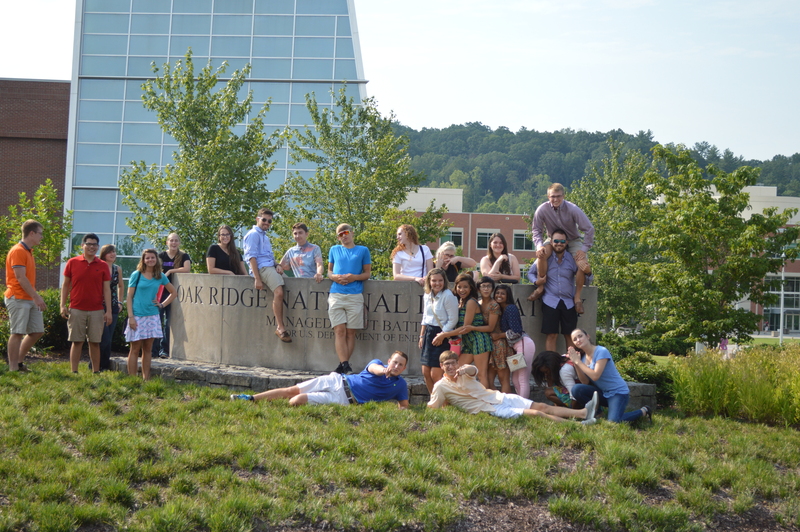 To end our time at ORNL, we journeyed to the Spallation Neutron Source. This is where the scientists at ORNL shoot neutrons at super high speeds and analyze the results. They can use this technique for detailed imaging and various other tests. The “track” that was used to shoot the neutrons took up a majority of the facility. This part was probably my favorite part solely because of the ground-breaking science occurring beneath my feet, literally! 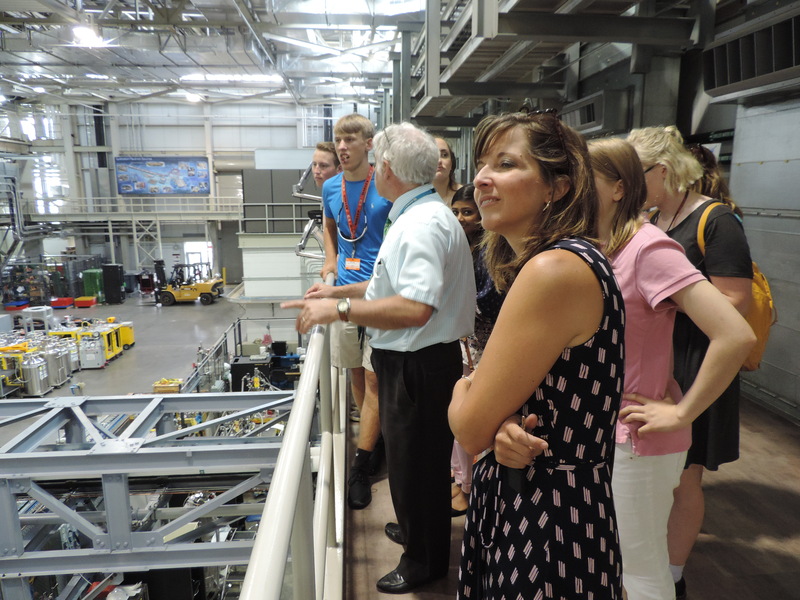 And the word that I would use to describe my trip to ORNL would have to be…Exceptional. This trip was just one of many great opportunities we will have during these three weeks. These trips give us the chance to see our dreams applied to real world applications as well as giving us a greater chance of landing a summer internship! Overall, I myself am very grateful to have this opportunity to see the scientific world that we have in our own backyard. This entry was posted in Uncategorized and tagged Maryville College, NSF, Oak Ridge National Laboratory, Scots Science Scholars. Bookmark the permalink.